We all do it every day. Take one look at a person and think we’ve figured them out. Listen to them for five minutes and presume to know makes them tick. As the saying goes, you never get a second chance to make a first impression. First impressions are important. You can never get it back. I don’t know him, but he does look interesting. The trouble is how we size people up. I’ve been quite surprised at times when I’ve looked at someone with tattoos from head to toe or multiple piercings, decided they were weird, and then found out they are some of the most delightful and interesting people I know. It’s hard not to do that, though. 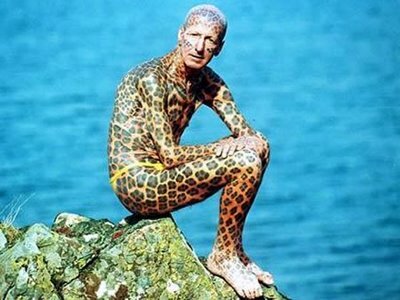 It could easily be said that someone who has tattooed themselves to look like a human leopard is trying to attract a certain amount of attention and surely expects a certain reaction. Or maybe they’re trying to prove a gigantic point. People are more than the sum of their outward appearance, begging someone to get to know them for what they are inside of that seemingly odd wrapping. Christians size each other up. They decide that other people who call themselves Christian can’t possibly be because their doctrine is different. “Oh, they think it’s okay to just sprinkle. That’s not real baptism, they’re not real Christians.” “That group believes there’s no hell. They’re not Christian.” “My goodness, did you see so-and-so drinking a beer with his peanuts at the steakhouse? I fear he’s not a Christian.” “And his wife, why, she was wearing pants!” All the while they’re assuring themselves that their doctrine is the “right” one. There are somewhere between 35,000 and 40,000 different Christian denominations. Some will say that most of these share core beliefs that make them all Christian. However at the root of it all there was some scriptural issue, some interpretation that caused a divide. And they all size each other up as to whether the others believe, “according to the scripture”, their way. If not, there’s a pretty good chance that other denomination isn’t really Christian. Scary, eh? Especially if you truly believe all of eternity is on the line. Even more disturbing is how Christians size up those who they believe to be non-Christians. Christians are to be in the world but not of the world. Anyone who is a friend of the world is an enemy of God. (James 4:4). That’s a sad place to be in – one I was in for many years. Deciding who I could be really good friends with and who I could associate with based on whether or not they were in the club. Finding out that a person wasn’t a Christian made them a project. Must.get.them.to.accept.my.Jesus. Is that any way to treat a person? As less-than because they don’t believe the same things as me? Obviously they haven’t had me tell them about the good news. Because if I tell them just the right way surely they’ll see the light. Surely they’ll see the error of their ways. No. No. No. This isn’t the way to treat another human being. Wouldn’t the world be a better place if we all stopped trying to force everyone else into our mold? Wouldn’t it be a better place if we saw each other as real people, with real thoughts, and real feelings all of their very own? Why is it so terrible to think that another person might have an individual thought? A free thought. One not exactly like yours. Categories: Uncategorized | Tags: Christianity, Doubt, Faith, Fundamentalism, What Other People Think | Permalink. When I got back home I knew I’d have to tell people I was engaged. What was I going to do? Wait until we got married and say, “Surprise! I have a husband!”? Somehow I don’t think that would work out too well. Though I must say it would be easier to tell people I’m engaged if I had an actual man to go with the ring. Most of the people I’ve told have never met him so I get some strange looks. Oh well, who cares? So this isn’t normal. What’s normal anyway? First I told Karen and Thomas. Karen has pretty much thought this whole thing was cool from the beginning. She’s payed attention to how The Tour Guide treats me and she knows how much he’s stood by me. Karen just wants me to be happy and if the The Tour Guide makes me happy then she’s all for it. Thomas really likes The Tour Guide. We all had a great time while he was here. I’m not sure if it’s the nature of his job in law enforcement or if it’s his personality, but he’s suspicious. I’m not sure what he’s suspicious of except that he told Karen he thought maybe The Tour Guide was just interested in immigrating to America. This, however, is coming from the man who is suspicious that his shadow seems to be following him a bit too closely. Nothing to be concerned about, really. He doesn’t have a reason to be suspicious, he doesn’t need one to be. I’ve considered offering him some of my medication for the paranoia, but I’m not sure that Celexa works for that. There was just one more to go. Grace. When I told her she asked, “Did he ever accept Jesus?” My reply, “We won’t be unequally yoked. He’s as much of a Christian as I am.” You see, the first time The Tour Guide was here, when we hosted the dinner party, Grace and Bill were invited. I’d made arrangements with all of them ahead of time. When Grace found out that The Tour Guide was staying at my house she was upset. After all she is the one that said if I pursued a relationship with him that there would be opposition. When I called her to confirm that she and Bill would be at our dinner party she said very flatly, “Bill and I have talked about it and we both hope this is what you want and that you’re happy, but no, we won’t be at your house for dinner. We don’t feel like we should be involved in this. We love you, but we have to avoid all appearances of evil.” Evil? Really? Later, after the Tour Guide flew home I reached out to her again and asked her to lunch. Asking her what she meant by that she replied that she thought maybe he was the reason my marriage ended. Again? Really? “No, Grace. That’s not what happened. I would have thought you would know me well enough by now to know that if that was what was going on I wouldn’t drag my friends into it. I wanted to include my friends because I value you and what you think, but obviously I didn’t realize just how little you thought of me.” Needless to say our friendship hasn’t been the same since. And that’s okay with me. We’re still friends, and I love her, but I can hardly see how it will ever be the same. Not because I can’t get past it, but I’m not sure she can. People are afraid of what they don’t understand. I do hope that maybe, with time, she’ll put that thought out of her head. What I know is that I can’t please everybody. I’m done with my days of trying to do that. I researched that unequally yoked passage. I tried my darnedest to “convert” The Tour Guide. At the end of the day he’s taught me some very valuable life lessons. One: You can be good without being Christian. Two: You should accept and love people for who they are and the way they are. If you don’t it’s not really love. And three: I was entirely more prejudiced and judgmental than I thought I was. He’s broken down a lot of my preconceptions and prejudices and challenged my thinking in many areas. He sees people from the inside out. That’s a beautiful trait to have. Categories: Uncategorized | Tags: Dating Again, The Good Stuff, The Tour Guide | Permalink. *Part 9 in The Tour Guide series. You can read Part 8 here. The Tour Guide and I never stopped communicating. We called each other every day just to check in, make sure the other was alright. I wanted to make sure The Tour Guide knew I wasn’t going anywhere. I was still there. He wanted me to know the same. We still talked about everything. We were best friends. I proceeded with my therapy session. First I saw the Psychiatrist, Dr. M. He asked some questions and I explained everything to him. He said that sometimes once you get going down the road into depression, you just can’t get back up without a little help. The chemical imbalance is a vicious cycle. He prescribed me Celexa and referred me to a therapist in his office. After the first two weeks on medication and my first therapy session I was already feeling like my old self again. My therapist, Dr. P, said I won’t be on the medication very long in her opinion and we scheduled another session. After the second session she said she didn’t see the need for me to schedule another. She’d be there if I needed her, but I haven’t needed her again. The Tour Guide gives me a wake-up call every morning. One morning my phone rang for my wake-up call. He was quiet at first. Then, “I’ve made a big mistake.” “What do you mean, what mistake?”, I asked. “I never should have told you I just want to be friends. I don’t want that. I miss you.” I replied, “I’m right here, hon. I’m not going anywhere.” So we made a fresh start – as much of a fresh start as two people who know each other so well can make. It wasn’t exactly starting over. But we tried to forget what was behind. We started making plans for The Tour Guide to visit me in April. That was going to be the first opportunity he’d have for vacation time. We both got impatient, though. That seemed like an awfully long time to wait. The last time we’d seen each other was in September. Seven months. Far too long. So I took a week off from work and flew to England to see him again at the end of February. Instead of planning something for us to do every day, we played it by ear. We relaxed and did whatever we wanted when the notion struck us. The only real plans we had were to travel to Farnborough so I could meet his friends, Jane and Michael. I had a fabulous time. We had wine, ate chip sandwiches, listened to music and danced. Michael and Jane left the room for a few minutes and The Tour Guide and I were alone. Sitting next to each other on Jane’s sofa I leaned over, kissed him softly, and said, “Will you marry me?”. He didn’t take me seriously, but said, “Yeah, okay, I’ll marry you, when you get down on one knee.” We continued on in our evening, spent the night at Jane’s and Michael’s, and the next day made the drive back to his place in Midsomer Norton. We had the most fabulous time together. His daughters came over and we spent a couple of days with them. We went to the park together, grocery shopped together, I cooked them some Southern Chicken and Rice. We took the girls home and the next day I flew home. This time I had butterflies in my stomach and a ring on my finger. Looking forward to my future, no longer looking back at the past. I’m going to marry that tall, handsome Brit who irons my clothes and makes me coffee – the one who wakes me up every morning with, “Ello, gorgeous girl”, and calls me “baby girl”. I have no idea why The Tour Guide is crazy about me, but I know he is. And I’m crazy about him. What prompted the change of heart? What helped me get past my paralyzing fear? I already knew what it meant to love another. The Tour Guide has shown me what it means to be loved. I’ll leave you with this quote that I heard in an interview during my search. When asked what the most important pieces of advice he wanted to pass on to his children were, Steven Hawking said, “One, remember to look up at the stars and not down at your feet. Two, never give up work. Work gives you meaning and purpose and life is empty without it. Three, if you are lucky enough to find love, remember it is rare and don’t throw it away.” I’ve been lucky enough to find it, I’m not throwing it away. So suddenly Blogger logged me out and I couldn’t log back in. I went to the help forum to report the problem, which apparently loads of other bloggers are having as well. Some of the others reported clearing their cookies and their cache, so I did the same and voila! I’m back in again. The only reason I’m posting this is to let others know if they’re having the same issues. Categories: Blogger Fail | Permalink. *Part 8 in The Tour Guide Series. You can read Part 7 here. As you can imagine all sorts of things were running through The Tour Guide’s head at this point. He was thoroughly confused. Because he’d never been exposed to the fundamentalism of Southern Baptist Christianity he had no idea what I was going through. No matter how much I tried to explain it, it made no sense to him whatsoever. In fact the more I tried to explain it, the worse view he got of Christianity. These concepts were so foreign to him they were almost unbelievable. He was just sure I’d found somebody else and was trying to let him down easy. That couldn’t have been farther from the truth. If I was going to be with anybody it was going to be The Tour Guide. It didn’t take him long to realize that. I was depressed and I was drowning in it. So The Tour Guide thew me a life preserver. He made the conscious decision to stick by me, to be a rock to anchor to. Even if he didn’t understand all I was going through he could see I needed a friend. So he dug in, gave me a shoulder to lean on and waited. He backed off of the romantic relationship because he could see I was in trouble. My friend, Tessa, knew I was in trouble, too. That’s when she drug me to North Georgia for deliverance. When that didn’t work I fell even farther down the hole. The Tour Guide and I were still speaking every day. On Thanksgiving weekend I admitted to The Tour Guide that I was struggling in my faith. I was having a crisis of faith that nearly drove me to a breakdown. Everything I’d ever believed was challenged. He wasn’t in a position to answer my doubts or calm my fears. He never tried to sway me in one direction or another. But he always listened to me as I tried to wrestle these things out. He was exactly what I needed him to be. By early December I felt I was ready to give the relationship another go. “Can we start over?”, I asked. “We’ll have to take it slower, marriage is off the table for now. Do you think you can do that? Take your time and think about it. You don’t have to answer me now.” “Let me think about it. I don’t know.”, he said. I understood that. I’d already snatched the rug out from under him and left him in whirlwind wondering what the heck just happened. It proved to be more difficult than he thought. He was tentative and guarded. And after Christmas he told me he thought we should just be friends. He couldn’t take the wondering when I might freak out and break his heart again. I couldn’t fault him. Now it was my turn to be patient and wait. I made an appointment with a therapist because I knew I needed help. After everything I’d been through I just didn’t think getting on my face one more time before a God I wasn’t really even sure was there anymore was going to suddenly be the cure-all that I had been so confident in before. I needed more than anything some peace. *Part 7 in The Tour Guide Series. You can read Part 6 here. We knew that wasn’t goodbye. The only problem was figuring out how to have a long distance relationship and do it well. Up until now we’d only done Yahoo!Messenger chat. That was never going to do if we were going to continue this. So I bought a webcam so we could talk to each other. It’s free! Who knew?!? And it’s pretty darned amazing. Don’t get me wrong it’ll never be the same as being together, but at least we can see and hear each other. As soon as The Tour Guide got back to England we were planning when I would come to visit him. I booked a flight for September which seemed like an eternity. In between May and September we really did bond and get closer. It may seem strange to some people, but a long distance relationship has it’s advantages. If both people are transparent and completely honest it can be a relationship builder. You can get to know the real person without the pressure of a physical relationship. Talking and sharing is all you have. We’ve pretty much shared every thought and emotion. There have been good times and bad times, scary times and excited times. The connection we both felt was so strong it wasn’t long before we were talking marriage and The Tour Guide asked me to marry him. I was so in love and so happy that I said yes. We began planning how we were going to make this happen. We paid a retainer to an immigration attorney and began gathering the paperwork to file for a fiance visa. That’s when it happened. I had a major meltdown. My cognitive dissonance started to kick in. I’d been witnessing to The Tour Guide this whole time. I’d been telling him how great Jesus is and debating with him the merits of creationism. That’s when he began to ask me the questions, unknown to him, that altered my faith forever. That’s when I began to really research divorce and remarriage. There were so many interpretations and I couldn’t figure out which one was right. So I broke off our engagement. It was all moving too fast and I had too many unresolved issues. I devastated him. I began to frantically search for the answers to the questions that now haunted me. Questions of creationism vs. evolution. Questions of the historicity of Jesus. Things I’d never even questioned before. All because of one little question. All because of one big statement. “I’d like to believe in Jesus. If someone could knock on my door right now and show me some kind of proof, any proof that Jesus was the Messiah, I’d believe. But they can’t. I believe Jesus was a prophet, a teacher. But the son of God? Born of a Virgin? How does that work? There’s no evidence outside of the Bible.” I truly believed there was. I was on a mission to prove it to The Tour Guide. But the more I searched the more questions I had. That was not The Tour Guide’s intent. He admired and respected my faith. I think he honestly hoped I had some answers because my faith was so strong. And it all came tumbling down. I felt like a big fake. Was I really living what I preached? No. Sadly, I didn’t feel that I was. We continued in our relationship and I went to visit him in September. We had a fantastic time as evidenced by the pictures we took and the places we went. I met his parents, his sister and brother-in-law and his two beautiful daughters. We had an instant rapport. His family is eclectic and beautiful. He showed me a fabulous time and I fell even more in love with the man who was strong enough to handle all my questions – who didn’t run out on me when I was at my worst and my weakest. I gave him ample enough reason to walk away and never look back. This all scared me half to death. I flew back to the States with a knot in my stomach, not wanting to leave and knowing I couldn’t stay. I didn’t know how to handle any of it. What was I going to do? I couldn’t keep this loving, kind, beautiful person in limbo while I searched for my answers. I felt I had no choice but to end our relationship. And so, as hard as it was, that is what I did, promising to remain loyal friends. *Part 6 in The Tour Guide Series. You can read Part 5 here. The only plan I’d made for us for the day was to get some groceries, rent a couple of movies and relax together. While this was a holiday for The Tour Guide, it was a trip with a purpose. We were getting to know each other, so we spent the whole day together – just the two of us. Hehe…I showed him the true American experience. I took him to Super Wal-Mart for groceries. We went kind of early so the crazies weren’t out just yet. We had a lovely day together and he learned an appreciation for Chick-fil-A sandwiches. It’s interesting seeing the territory where you grew up through the eyes of someone who’s never seen it. It was all new to The Tour Guide. So many things fade into the backdrop when you see it every day. The Tour Guide was amazed at the number of billboard signs. Those aren’t allowed in England. He wanted to drive, so I climbed into the passengers seat and attempted to give him instructions. Those amounted to: everything’s the opposite of what you’re used to. I’m not a good driving instructor. 😦 I kept forgetting to tell him what to do at intersections and traffic lights. I’d made arrangements ahead of time for a couple of outings. Karen and Thomas have a boat so they took us out on the river at a nearby state park. Karen, Thomas and I have all been there a number of times, having grown up in this area, so we’re familiar with the surroundings. When we arrived we all got out, chatted for a few minutes and then Thomas was ready to put the boat in the water. He asked the tour guide to help out and just as he was about to wade into the water The Tour Guide noticed the sign right next to the boat ramp. “Beware of Alligators.” He turned to look at Karen and me, his eyes as big as saucers, and said, “Wait a minute. No body told me anything about any flippin’ alligators!” Then he waded right on into the water and helped Thomas put the boat in. Then it wouldn’t crank. He and Thomas worked with the engine a bit and in a few minutes Thomas had it running. We cruised around the river just chatting and enjoying the nice, sunny day. And The Tour Guide got to see some rather large alligators sunning on the bank of the river. The Tour Guide had never held a gun before. Thomas took us down to their homemade range and taught him how to shoot. We had a blast with that! Then we shot bows and arrows and played poker all afternoon. Karen and Thomas have a little boy, Evan. He was two at the time and he absolutely loved The Tour Guide. Even now he asks me if he can talk to The Tour Guide. We went to church on Sunday and spent a lot of time just enjoying each other’s presence. We even hosted a dinner party together. We made salad, homemade lasagne and garlic bread. Karen, Thomas and Ethan and Danny and Tessa all came for dinner. Then Thomas treated us all to some venison. I think that may have been The Tour Guide’s favorite. You know that movie, Jerry Maguire? The part where Dorothy says, “Shut up. Just shut up…..You had me at hello. You had me at hello.”? Nice cliche, don’t you think? On the second day The Tour Guide was here he needed to iron something. We’d already joked about whether I even owned an iron because at some point during one of our many conversations I’d told him half-jokingly I didn’t wear anything the dryer couldn’t iron. I was only half joking. Anyway, I offered to iron whatever it was and he insisted on doing it himself. I set up the ironing board for him and gave him the iron and went on about my business doing something else. Then he emerged from the other room, looked longingly into my eyes, and said, “Hun, do you need anything ironed?” He had me. He had me at do you need anything ironed. One thing was certain. The week was far too short. We had a fabulous time and we were never going to be ready for him to go home. The morning he flew back to England Karen brought Evan over to say goodbye and after she left we quietly got ready for the three hour trek back to Atlanta. Embracing each other on my back porch he said, “This would be far easier if we’d fought all week long.” I responded, “This would be far easier if we’d fought at all.” I don’t think either one of us expected it to feel so right to be together. When we got to the airport he checked his luggage and we went back outside. We hugged, we kissed and then he said, “Now go, just go ahead and go.” So I walked away. We didn’t say goodbye. I kept looking back and The Tour Guide was still standing in the same spot. Every time I looked back he’d wave and then motion for me to keep going. He watched me walk away until I disappeared into the darkness of the parking deck and he could no longer see me. I turned around for one last look, and he was gone.